The drivers of growth will continue to be consumption, big infrastructure projects and tourism. The investments in infrastructure will be channelled through public–private partnerships, which boost growth in the medium term, but pose certain risks in the longer run. 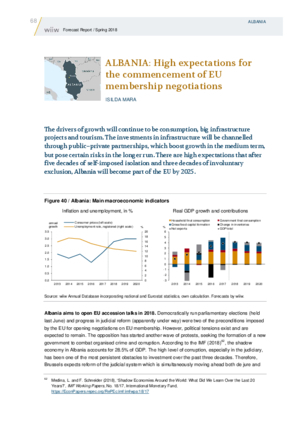 There are high expectations that after five decades of self-imposed isolation and three decades of involuntary exclusion, Albania will become part of the EU by 2025.